What, exactly, does the switch in Win10 1803 from “Semi-Annual Channel (Targeted)” to “Semi-Annual Channel NOT (Targeted”) really mean? Home › Forums › AskWoody blog › What, exactly, does the switch in Win10 1803 from “Semi-Annual Channel (Targeted)” to “Semi-Annual Channel NOT (Targeted”) really mean? This topic contains 39 replies, has 15 voices, and was last updated by anonymous 9 months, 2 weeks ago. According to Microsoft, “Semi-annual Channel (Targeted)” is just the newly-renamed Current Branch (CB), which means you get slammed with updates as soon as MS deems it appropriate. “Semi-annual NOT (Targeted)” is the newly-renamed Current Branch for Business (CBB), which should give you the usual ability to delay those updates. Maybe that wasn’t what you were asking? I posted the info I have so far as a guide. There are lots of explanations on the web, but I’m looking for something very simple — something For Dummies, if you will — that tells me exactly what changed yesterday. “something For Dummies”, Woody if you find out you might want to send the information to MS’ ‘marketing’ department. Aside, why is the tune to ‘Send in the clowns’ seem appropriate in this case. Marketing doublespeak that means whatever is convenient for today. I would assume “fully available” means it gets deployed to all the machines but is still not believed to be in good shape enough for business. removing “(Targeted)” would mean it’s ready for business. Not sure I see the mystery here. There’s only one 1803. If you set your Pro/Enterprise computer to Semi-Annual (Targeted) with no deferral, you’ll get it on 4/30/18. If you set your computer to Semi-Annual with no deferral, you’ll get it on 7/10/18. I would think that the 120-180 days begins based on the chosen servicing option, in my case 7/10. Yet to be confirmed. I understand that 1803 was supposed to be installed on April 30 — the release date — on 1703 machines set to CBB and 1709 machines set to Semi-Annual (Targeted), with update deferral set to 0 days. I believe you’re right in saying that 1703 machines set to CB and 1709 machines set to Semi-Annual, with update deferral set to 0 days, should start getting the update today. But what’s the difference between “fully available for all compatible devices” (June 14) status and “S-A C” — especially when MS has already pushed 1803 onto machines set to block it? I would think that the 120-180 days begins on the chosen servicing option, in my case 7/10. Yet to be confirmed. That’s a crucial question, and one that hasn’t been tested as yet, to the best of my knowledge. The definitions, settings and terminology, have changed so many times, I’m not sure when we’ll be able to tell for sure when that particular clock starts to tick. I just opened my 1607 laptop that I didn’t use since 1607 was out of support. I got 1703 offered again, not a later version, with same deferral settings as my other Win 10 station, nothing different (CBB + 365 days deferral for feature updates in local GP, no meter trick, telemetry to 1, delivery optimization altered (99 I think)). Windows said it couldn’t apply the patches it was waiting to apply for 1607, then I hit search for updates and got 1703 feature update shown as available to download and install. They’ve “altered the deal” so many times it’s still such a mess to try to digest. If you are set for SAC (which was CBB), with no deferral set (1-365 days), as of yesterday, you were offered 1803 (and unless you’re set for a metered connection, or blocking the update with wushowhide, it’s installing or has already installed itself). You will get 1803 release 17134.165 which means you are bleeding edge including the cumulative updates from Patch Tuesday (yesterday). If you are set for SAC(T) (which was CB), with no deferral set (1-365 days), you got offered 1803 on 4/30 (judging from the chart, and again assuming you are not on a metered connection or blocking the update with wushowhide) which would correlate to release 17134.1 according to the 1803 release history chart below the main chart we’re looking at on that page. At that point you were on bleeding edge, but now, obviously a few months has passed so you have a few cumulative updates already applied. IMHO, changing Branch Readiness is not enough now – if it ever was truly “enough”. Given MS’ apparent penchant for throwing releases out during their infancy, I think you’d be nuts to be a Win10 user and not have a deferral period set. I think you’re wise if you at least set security deferrals to 21 days, and even brighter if you set it to the max of 30 days, since by that time, those updates have went through some maturation and have been pulled and fixed, if necessary. (Somewhere around the 21-30 day period is obviously when the MS-DEFCON rating improves and Susan has also given her blessing, so the updates at that point are safe to install.) Furthermore, setting the feature update deferral to at least 180 days (6 months) is IMHO a minimum. 1709 took awhile from launch to get stable, and 1803 at this point is anyone’s guess as to how long it will take to get there. I will say this as well – on my 10 Home laptop which is generally a throwaway system (as it’s only sparingly used), I’ve hidden the 1803 feature update several times now, and it keeps being unhidden… I assume by MS by changing a bit here or there which then flags the update as “new”; the same trick they’ve pulled since the beginning of time with KB2952664 and KB2976978. Because of this, I think the lack of reliability of wushowhide is quickly becoming apparent. They give us tools to manage things by jumping through hoops for systems not behind SCCM/SUS, but they keep “altering the deal” and making the tools worthless. What, exactly, does the switch in Win10 1803 from “Semi-Annual Channel (Targeted)” to “Semi-Annual Channel NOT (Targeted)” really mean? It means you get it now (unless deferred) automatically. Win10 1703 Pro computers set to “Current Branch” with 0 days feature deferral are now getting 1803 pushed onto their machines. Win10 1709 Pro computers set to “Semi-Annual Channel” with 0 days feature deferral are also getting 1803, starting yesterday. I see how that fits. But what was “fully available for all compatible devices running Windows 10 worldwide” back in June? Any change to the WSUS feed? Is it now getting 17134.165? Maybe it is not pushed to everyone with no deferral or CBB setting according to telemetry until it is deemed fully available for everyone? That way, they push a bit to some and the seekers, and then if nothing too bad breaks (the criteria being maybe a bit low), it becomes fully available to everyone except for those on deferral and CBB setting? I believe that’s the case. First, I was one of Susan’s examples of a machine that I thought shouldn’t have been upgraded. Microsoft analyzed the logs and found that machine wasn’t on Semi-Annual. Turned out that that machine didn’t get the servicing policy due to a group policy issue. So not a deferral issue after all. I hadn’t read the link behind “fully available for all compatible devices” before. Pretty interesting that they are using AI to control the rollout. To me that sounds like a separate throttle that has nothing to do with the servicing option. Let’s say your servicing option says you should be getting the feature update, but the AI knows your Avast Behavior Shield (using their example) will cause the update to black screen. MS blocks the update that you would otherwise receive. When they say “fully available,” all blocks are turned off and if you are on schedule to get the update, you will. Of course, this will be small consolation to the people running Avast Behavior Shield who updated without deferral; they acted as the beta testers who provided the telemetry that told the AI to block it for the rest of the world. The AI article is a tacit admission that MS can’t test everything; they can only release, gather data, and respond. Anyone need further convincing to use deferrals? Not only that, but obviously their AI is running based off the telemetry they get – which lends credence to the notion that if you have telemetry disabled, they have no idea what to do with your machine and therefore it’s likely to get upgraded (before it should be) as well. For those out there who are against telemetry, that puts a huge kibosh on them ever running 10, if it means that they have to allow telemetry in some capacity to actually get legitimate updates when they should (and not when they shouldn’t). The can of worms just keeps getting bigger and the worms keep multiplying. I think you can only completely turn off telemetry on the Enterprise edition. Hopefully people running Enterprise know to use deferrals. I’m moreso wondering for people who shut off (and change the startup type to disabled) of the telemetry service (diagtrack). The lowest you can turn telemetry is 0 which is the Security only level in the Enterprise and Education sku’s. IIRC, the previous articles about forced upgrades were on machines with “telemetry disabled” which I assume is via the stoppage of the service responsible. I think Microsoft has literally sent themselves into a death spiral with this methodology. They’ve hung the entire success of Windows 10 on the lynchpin of telemetry, and written themselves into a scenario where the only path to success for WaaS is if their userbase willingly offers up all the data they want to collect. The system sounds completely dependent on the idea that users will trust Microsoft with all of their data. I don’t think Microsoft has ever earned that level of trust, and what little they have now is being worn away at a breakneck pace. Is the leadership at Microsoft so oblivious to reality that they actually think users trust them enough for this to even have a snowball’s chance in hell of ever functioning as intended? I think an example of how Microsoft abuses trust is that when users set telemetry to 0, and they aren’t an Enterprise, Microsoft decides to update/upgrade them immediately. It makes more logical sense to put those users on hold (they aren’t going to get any useful telemetry from them, anyways) and have them update later, when the bug-fixes are in… but someone at Microsoft sees value in bullying end-users, and punishing them for not going with their priorities… sort of ‘we need beta testers, so you will be one’. Why would anyone who experiences, or witnesses, that kind of decision, trust them? It isn’t a mistake… someone in the company had to make that decision, and someone had to approve the final decision… and that person/group interacts with others in terms of power and control… the exact opposite of cooperative, supportive, community building and end-user sensitivity based decisions that cultivate trust. Well it used to be once over you went with M$’s recommended settings, mainly for a quiet life, and that you had a little trust in them as in they had a good idea what they knew what theyre doing. However with the introduction of Win10 the “Goal Posts” have moved especially with Win10 and/or updates so if its hidden I generally select that. The inclusion of “(Targeted)” in the description generally sounds like it has some unfortunate connotations. I would even go so far as to suggest that M$ is gambling on the fact that the majority of users/and average users will just “breeze” past that setting and leave it alone. As has been stated in here may times we are in effect “Beta Testers” for anything that comes down the update/upgrade chute. In practice I have seen no discernible difference in the behaviour of Win10 Home and Pro, Both set to metered, Pro deferral set to 30+365, GPOL set to exclude Dvrs, Basic Telemetry, Notify before download and install. On the work machines (1803, 1703, 1709) and Home machines, Home(VHD)+Pro (1709) just one attempt, sort of, to upgrade to 1803 which was stymied and hasn’t happened again. I would assert that its probably more M$ “bafflegab” to muddy the waters, and @woody don’t worry you me both. It took me months to figure out what it (the terminology) was really driving at and I am not sure if I am totally “au fait” with it now. The SSU may not show up in WU. It is dragged along by the CU and installed first without announcement. So not seeing it is not unusual. As long as you have quality deferral set, the current updates won’t show up in WU for that many days. That’s why I leave mine at zero, so I see them. But they don’t download b/c of the auto update = 2. And the notifications are not set in WU but in the Settings App. You may have them disabled there (along with ones you really don’t want). Microsoft usually issues two Win10 CUs per month. The Security CU is released on Patch Tuesday. The Non-security Cu is released on the third Tues. or later in the month. I believe the second CU of the month is like the “Preview Rollup” for Win7/8.1 (also called non-security b/c it contains the non-security fixes for the following month). My Win10 Pro systems are set to CBB/SAC, delay Feature Updates (upgrades) = 365, delay Quality Updates = 0, and no pause. In Group Policy I have Automatic Updates = Enabled,2 (notify download/install) and Deliver Optimization = Enabled, 99 (simple download no peering). I am currently running 1703, 1709 and 1803 with those settings. I am offered the Security CU on Patch Tues (delay Quality = 0) every month. I am not offered the non-security second issue CU. The Patch Tues updates show up immediately in WU on Patch Tues. (delay = 0) but are not downloaded until I click on the “Download” button. I do not have to search for updates (watch out “Seekers”) to be able to see them. I can hide patches with wushiwhide. It is my belief that if I change to CB/SAC (Targeted) (the hit-me-with-everything setting) that I will be offered the non-security ”Preview” patches (second CU of the month). This does not include Feature updates, as they are delayed = 365. I think I will be offered the Feature updates based on my delay setting. When I wanted to update 1703 to 1709, that’s what I did (set feature delay = 0, CB) and was offered the Upgrade.When I wanted to upgrade 1703 to 1803, that’s what I did, but I had to hide the 1709 upgrade to be offered the 1803 version. I believe CBB/SAC and CB/SAC (Targeted) only control the way you get monthly Quality updates as long as you have Feature Updates delayed. If you do not have Feature updates delayed, CB/SAC (Targeted) may get Feature updates immediately or at the pace MS decides to roll them out. Without delay, CBB/SAC may get the Feature updates on or after the next version is declared suitable for business. So CB/SAC (Targeted) and CBB/SAC control Feature updates as long as Feature delay = 0 or the delay runs out. This is the way my systems have been running – my experience. This is for Win10 Pro. All of this UNLESS MS decides to force Upgrades at their whim. The SSUs are usually mentioned ot the bottom of the page for the MS CU if you look up the KB #. If you are installing manually, they need to be installed first. If you use WU, they are automatically d/l and installed without mentioning them. I haven’t been run over by forced upgrades YET with my settings. @pkcano Hmmm thanks for the swift reply, I have been mulling over the “log Jam” with 1803 UD’s for a while now. I, think, can safely move one of them to “Targeted” tomorrow and see what happens, my curiosity has been piqued enough. If memory serves me right, I did this with CBB to CB last year and there wasn’t a whole lot of difference, if any; Worth a try if only to clear up the confusion. Loved the inclusion of YET its definitely figuring more in Post’s just lately. And as a corollary, the June 14 AI crowing post “we are now expanding the release broadly to make the April 2018 Update (version 1803) fully available for all compatible devices running Windows 10 worldwide” means and meant exactly nothing. Maybe it means it ‘s not just available to “Seekers” and the MS “most likely to succeed” devices, but to everyone whose settings are right. Windows is now a service that is manged from the MS bunker somewhere. You have two choices for updates regardless of what they are actually called. We’ll use targeted and non-targeted. 1) Is the requesting platform one that our AI recognizes as being a good fit for the feature update at this time? 2) Is the requesting platform one that our AI doesn’t yet know or is uncertain if a feature is a good fit at this time? 3) Is the requesting platform one that our AI knows is *not* a good fit at this time? Groups 1 & 2 will probably get the update as there is either no reason not to install it or MS really wants the data on how your platform responds. Group 3 will be deferred until later when MS knows the blocks are sorted out. Zero Day – Requesting platform does not wish to receive the feature update until the AI is satisfied that all blocks to a successful installation are resolved regardless of the AI’s near certainty that the install can proceed successfully. Requesting platform wishes to wait the specified number of days after feature update is declared non-targeted for reasons that the AI & MS don’t necessarily understand and probably don’t appreciate. or MS really wants the data on how your platform responds. What’s next? Phase A/B? Or just Defer (which starts from the initial availability date)? Thank you, @b, for linking to that blog post by a John Wilcox… a Microsoft employee on the Microsoft Tech Community. Reading that gave some humanity to Microsoft’s side of things. May I suggest that changing the wording is not helpful. No one wants to be learning new terminology all the time. They want to know how to do what they need to do… and what they need to do may not be what Microsoft wants them to do… or maybe there is a more responsible way to lead businesses and personal users into falling in love with them again. I used to love Windows, but I’m pretty well done with its bad behavior, stumbling over telemetry and forced updates… for a minute, reading John Wilcox’s piece, I had a glimmer of hope that someone is paying attention, and might change the way they are leading, rather than yelling out step counts in another language (French, or Japanese, maybe?). How do you teach AI to dance? Right now its acting like a school yard bully. I neither want to be misled/manipulated, or bullied/forced. I keep thinking how good it felt (for both partners) to float across the floor, coming together, moving apart, but always in tune with the music and each other. It sounds like, or am I too naively hopeful, that John Wilcox might have some sensitivity to what is going on with Microsoft’s business partners… and is looking for a way to work with them? He might have to realize, though, that there is something abusive about being forced to beta test. I don’t think we were spoiled by the disbanded testing division of Microsoft… I think having it was a good business practice to not inflict problems on customers. Maybe there is a future where the AI is refined enough not to push end users around, but that future is not here yet. Competing for financial incentives based on numbers of users, or speed of feature updates, is counterproductive to moving in balance, in step, safely and securely, with a partner. I can always change partners, especially when I’m getting my toes stepped on too hard, or too frequently. Microsoft- I’m thinking we need a little love and romance here, someone to lead rather than dominate, and a little sensitivity/empathy would help. We do not need another change in terminology to trip and fall over! Please! I suggest that the difference is that there is no “me” in “AI”. I wish I could contribute more directly to this discussion. It has certainly been interesting to learn that there is an AI decision-maker at work… It would help explain what I’m seeing. Somehow I now apparently have the Win 10 VM that I run in a state where Microsoft’s AI simply does not choose to update it. I don’t know why – it never tells – but even with Windows Update services enabled full time and unblocked by the firewall I’m simply never offered anything but Windows Defender updates, MSRT, the occasional Flash update… NO cumulative updates are ever shown even though I’ve not set any deferral, and I’m (Targeted). I’m not complaining, mind you – it’s nice – though it would sure be good to know why it’s working this way. The Windows Update section of the Settings App reports “Some settings are managed by your organization”, though a review of all the policies it lists reveals they are NOT set. Telemetry is blocked though. That could be the root of it. Basically this leaves me with the ongoing choice to do nothing and continue running a working system, or go to the catalog when it’s convenient and install the latest cumulative update. Exactly everything I want. Though I had a specific problem installing manual updates last year, the catalog updates have been going in smoothly lately for me without any muss or fuss. Result? Lately I’ve had THE BEST user experience with keeping Win 10 up to date that I’ve logged since it was first released. My VMs have simply been available when I’ve needed them for as long as I’ve needed them, and when I get a break in work I update them from the catalog. Straightforward and manageable. I just took the July update bringing Win 10 to 17134.165. Hear that, Microsoft? I have the choice and it requires me to initiate, yet I AM keeping Windows 10 up to date. Reimagine that! IF I could actually plan on it working this way on my hardware, I might start to think about putting Win 10 on it. But an uncontrollable AI making decisions about how MY computer – a device critical to my business’ well being – is to run? Unacceptable. – Does this computer have any updates that are now deferred? What are they? 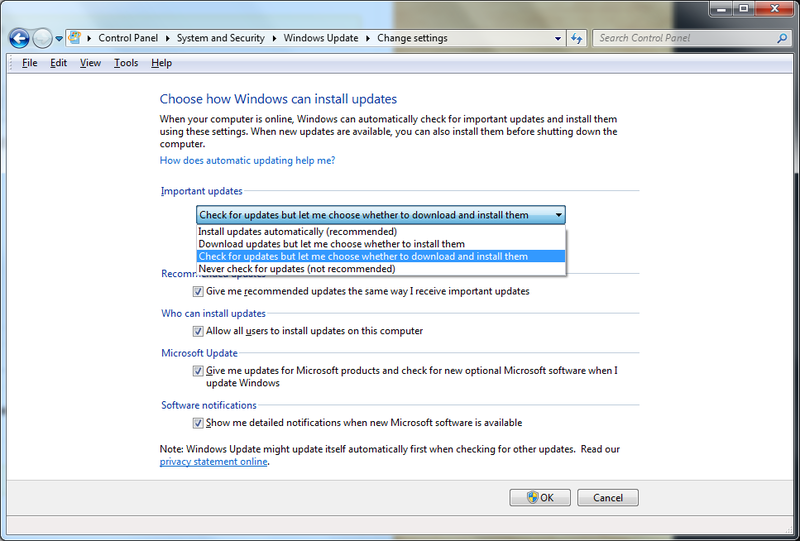 – When will the deferred updates be installed if no action is taken? i.e. how much time is left to complete testing for each one? – If testing concludes that an update is OK, can it be installed? How? – If testing concludes that an update is problematic, can it be prevented? How? So, simply deferring updates almost seems useless unless one can manage the follow-on actions and get known results. Is quite the convenience given how Microsoft is pulling out of Online Support sometime this month if not already. Have been trying to get straight answer as to when & what EXACTLY is affected by that. Now we have a situation basically like February went again. If anything am glad I was able to find some post’s about blocking any further “updates” from Window’s 10 after a 2nd trip to (luckily) a Microsoft Store within my city for the 2nd Factory Reset. All because of 1803!! This last trip was almost 2 week’s from the initial onslaught which somehow bypassed the configuration from the 1st time to wind up formatting a USB recovery drive & corrupted a CD & DVD BOTH that the Technician at Microsoft helped me get created for Windows 7+10 with 1703 version ISO on the USB stick! Sunday night just to be sure I pulled the Ethernet cable & Monday night pulled the power on my router to be 110% sure “Patch Tuesday” wouldn’t involve a 3rd visit for repairs. Was somehow boosted to 1709 still…But at least it is stable & nothing has gone bad that I actually need to care about (YET!) unless count the useless app store as refusing to acknowledge why it won’t allow even the Troubleshooter to turn it back on. I’m so glad I decided 2 years ago to deploy ONLY Windows 10 1607 LTSC on all my new workstations. I don’t miss Cortana, Edge, the Microsoft Store, or most importantly that feature update monthly nightmare of updates that always ensues! Reply To: What, exactly, does the switch in Win10 1803 from “Semi-Annual Channel (Targeted)” to “Semi-Annual Channel NOT (Targeted”) really mean?